University of Queensland) met at Melbourne airport on morning of Thursday September 7th for the start of the 2017 CAIGE barley tour. 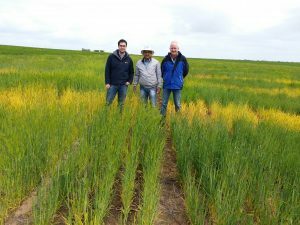 From Melbourne we drove to Horsham they met with Laura Roden (Technical Officer - Cereal Pathology, Agriculture Victoria)\, and visited disease screening nurseries net blotch and leaf rust evaluating barley lines and landrace imported from ICARDA. Good levels of resistance being observed in many of the ICARDA entries. As a pathologist Sajid, was noted as remarking that the trial was very good for net blotch (meaning that there were high levels of disease expression). Friday morning saw us on the road again, driving to meet Paul Telfer (Barley Breeder, AGT) at the Pinaroo (near boarder with South Australia) yield trial of ICARDA breeding lines and Australian checks. From 2017 these yield trials were composed almost exclusively of 2-row types (with the exception of the 6-row ICARDA check VMorales). 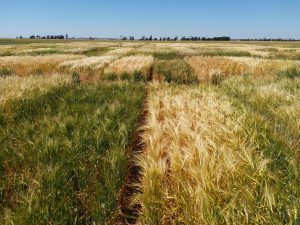 ICARDA breeding lines included in these trails were selected by Australian barley breeders (Amanda Box, University of Adelaide, and David Moody, Intergrain) during their visit to Morocco in April 2015, or lines that had been shown promise in the 2015 and 2016 CAIGE yield trials. The Pinaroo trial was mostly well established, and showed good differentiation amongst the lines tested, in a relatively low rainfall environment. Hugh Wallwork and Sajid Rehman discussing production of scald inoculum. 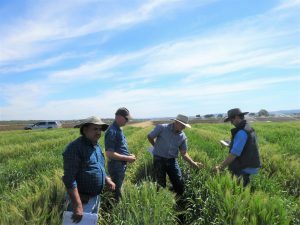 After an overnight break in Brisbane, the tour recommenced after lunch on Sunday, stopping at Gatton to inspect the seed increase rows of materials that came at of quarantine at the start of 2017 (ICARDA breeding lines selected in Morocco in 2016, and landraces selected from disease and insect resistance, and for heat tolerance), and another replicate of the 2017 barley CAIGE yield trial. The Gatton trial had been grown under irrigation, and was showing excellent yield potential when inspected at this time in September. That evening we stayed in Dalby. Dulacca CAIGE barley yield trial. been grown almost exclusively under stored water in the soil profile, with essentially not rain received on the trial since it was sown in May. The ICARDA lines were looking very promising in this water limited environment. 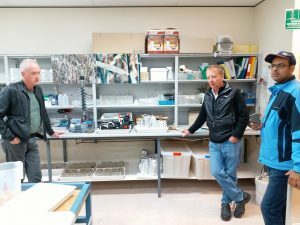 On morning of Tuesday September 12 we met Greg Platz (Senior Pathologist, DAF) and Ryan Fowler (Pathologist, DAF) at the Hermitage Research Facility, and spent morning discussing barley foliar pathogens, and inspected disease screening nurseries of the CAIGE materials. Unfortunately, the there were very few disease symptoms in the Hermitage trials due to the very dry and cold winter that they had experienced this season. Ryan and Greg then took us to the Redlands research facility where they had established a spot blotch screening nursery - and the pathologists in the group were very happy to see significant disease expression on the spreader rows and test varieties. Many of the ICARDA lines were show high levels of resistance to spot blotch under very high levels of disease pressure. After leaving Greg and Ryan, it was back to the Brisbane airport where Ramesh and Rajid were dropped off for their flights home.